Keeping in mind the exact demands of clients, we manufacture and export a wide range of Drivers Gloves. Our Gloves are extensively demanded for easy grip, high quality and utmost comfort. These are developed using high quality fabrics to ensure rough and tough usage and durability. 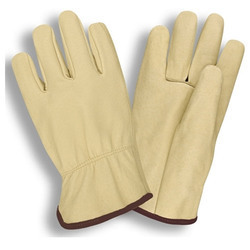 Our Drivers Glove range includes Yellow Grain Gloves (Drivers) and Yellow Leather Glove. 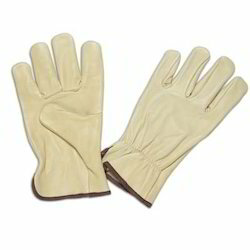 We are one of the leading manufacturer & exporter of Driving Gloves Yellow Grain. Our glove are widely demanded for perfect stitch work, durability and high quality. These are fabricated using premium quality fabrics to offer long service and ensure rough and tough usage. We offer adjustable elastic in the wrist which offer perfect fitting to the wearer. With the availability in various standard sizes and other specifications, our gloves are reasonably priced. We supply an entire range of Beige Leather Driving Gloves and keep innovating them based on current market trends and expectations. Our aim is to provide our customers with an exceptional range of Gloves in various styles, patterns and colors to suit varied client needs. These are manufactured using rubber coated polyester fabrics and are available in different colors. Compared to nylon and plastic, our range is durable and is 100% water proof. 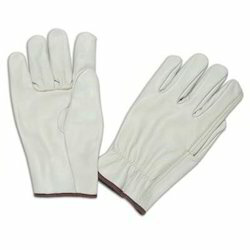 This is highly durable and efficient kind of driving gloves has been manufactured from beige grains. Beige is nothing but a textile fabric. It is pale yellowish or grayish in color. The uses of Industrial gloves incorporate a lot of ranges. Beige is french word which means a kind a natural wool. It is pale sandy fawn, light yellowish or grayish tan in color. 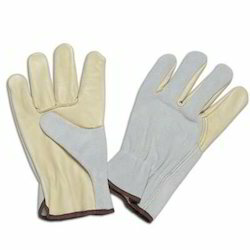 So Beige Grain Driving Gloves is a kind of gloves made from beige and used to drive any kind of vehicles. Superior quality Yellow Leather Driving Gloves are available at competitive prices compared to all other available in market. 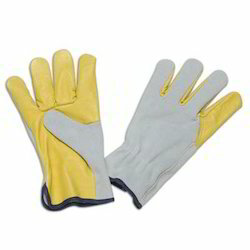 These Yellow Leather Driving Gloves are manufactured using supreme quality polyester fabric having a rubberized coating.